Today I have just one photo...but what an experience this was! Since this was our first trip to Paris, Emily researched things to do and restaurants to try for months beforehand. I'm so glad she did! We approached the door of this tiny restaurant and it looked closed....then a sweet elderly woman popped out the door and in rapid French urged us to come in. We still can't believe we got in, because it has excellent reviews but doesn't take reservations. It's a very small--just four or five tables in a tight space, very charming and homelike, run by just one woman (she referred to herself as Mami) and her husband, though he wasn't there that night. She was the hostess, the server, and the cook. Mami doesn't speak English but was so sweet, attentive and charming! She kept coming back, offering more wine or her homemade liqueur, or her sangria, or little treats, and gave us each little gifts-- mementos of Paris. The food was excellent, the experience was unique and fun. And what an adventure, having a complete language barrier and yet enjoying every moment. I left feeling like I had been at a beloved grandmother's house, because she hovered with such great concern for our happiness. Through her, I could almost imagine what it might have been like to be blessed to have a living, loving grandmother while growing up. I still feel like I was a guest in this lovely woman's home and should write her a thank you note. I will never forget this wonderful evening! And it also made me think. 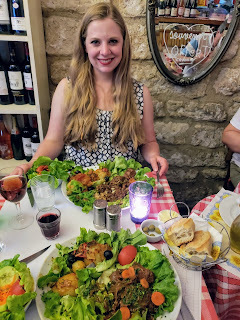 We are blessed with five young grandchildren, and I now hope that each time they leave a meal at our house, they feel just as cared for as I did that evening in Paris. What are some of your favorite memories with relatives and special meals while growing up? We always had fresh trout that my grandpa caught when we would visit my grandparents. And we had a lovely experience at a French restaurant near Lyon, France, many years ago. The only person who spoke enough English to take our order was the chef. He came out from the kitchen to get our order. We found out later he was in the French blue book of chefs. I thought I had replied to you, but must not hit the Publish button. Oops! I'll bet your grandpa's trout were always the best! And what a great experience you had in France. What fun!! I watch my grandkids (ages13, 10, 4.5, & 19 months) Monday thru Thursday. When they arrive on Monday they are starved for love and Oma’s cooking, because according to them receive no food all weekend and no love. It is our joke. My mom grew up living near her maternal grandmother - the family farms were back to back. She said bread always tasted better at Oma’s house. As she became a teenager, she realized that her mom actually baked the bread for both homes. Location is what maters. Wonderful story about a memorable evening, Roxanne. I hope to get into that restaurant while I'm in Paris! I hope you do, too. It was so tin, and such fun! I meant to type "tiny", not "tin." Ooops! What a wonderful experience to share with your daughter! Thanks, Lyn. It meant so much to me to have that trip with Emily! I loved Paris. So much fun. I loved it so much that I am still reading books about Paris and I want to go back!. Thank you, Roxanne, for sharing your lovely experience with us! As an only child, I always loved big family dinners with my grandparents, aunts and uncles, and many cousins. Thank you, Magdalena! I know what you mean. I just have one brother, so when I married into my husband's big, extended family, I loved (and still do) every family occasion!